Ten growers in Malaysia, Indonesia and Papua New Guinea were responsible for almost 35,000 hectares (ha) of deforestation in 2018, according to analysis by Chain Reaction Research (CRR). This total represents around 47 percent of the 74,000 ha of deforestation that can be attributed to palm oil companies in 2018 in Malaysia, Indonesia (Kalimantan, Sumatra, Sulawesi and West Papua) and Papua New Guinea. In 2017, deforestation attributed to known palm oil companies in the same regions of Indonesia alone amounted to approximately 95,000 ha. The continued moratorium on new palm oil licenses in Indonesia. This moratorium, plus new RSPO Principles & Criteria that bring the Roundtable on Sustainable Palm Oil (RSPO) further in line with NDPE commitment to peat and High Carbon Stock conservation, could allow this trend to continue throughout 2019. The largest deforester in 2018 was the group of companies in East Kalimantan owned by the Indonesian businessman Mr Sulaidy. The companies include PT Citra Palma Pertiwi 2 and PT Borneo Citra Palma Abadi. Both plantations are owned by PT Bangka Bumi Lestari (BBL), which Mr Sulaidy has 99 percent shares in. Almost 7,000 ha of forest was cleared on these plantations in 2018, according to CRR. Little is known about Mr Sulaidy, the size of his business operations, or who buys palm oil from his companies. As previously reported by CRR, the nearest mill to both plantations is PT Ketapang Agro Lestari, owned by First Resources. 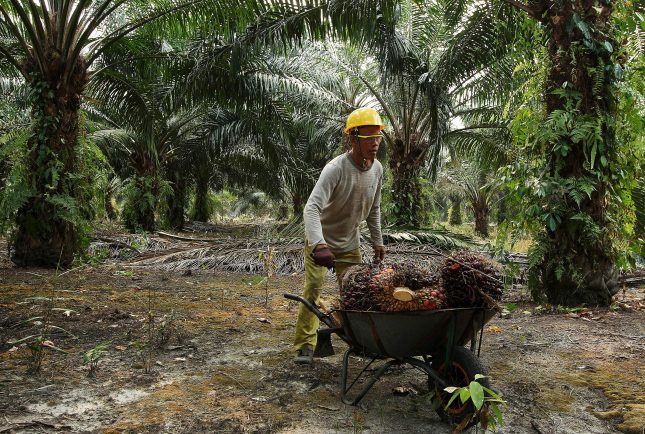 First Resources has confirmed that it does not purchase palm oil from BBL. The plantations are either not yet productive or are servicing the leakage market. The second biggest deforester of 2018 was Jhonlin Group, which cleared almost 5,000 ha. Jhonlin Group was founded by the businessman Haji Andi Syamsudin Arsyad, commonly known as Haji Isam, a coal entrepreneur from Batulicin, South Kalimantan. Jhonlin Group has a total land bank of more than 160,000 ha. There are 18 known companies belonging to Jhonlin Group and the wider Isam family. Their plantations are in East, South and Central Kalimantan. Two companies in the group, PT Adisurya Cipta Lestari and PT Batulicin Agro Sentosa, sell to a number of traders with NDPE policies, including Sime Darby, Bunge Loders Croklaan, Fuji Oil and Cargill. In 2018, Jhonlin Group cleared forest on its PT Multi Sarana Agro Mandiri, PT Pradiksi Gunatama and PT Kodeco Timber plantations in Kalimantan. The third largest deforester was the Tanah Merah project in West Papua. The project is believed to be operated by the Yemeni palm oil trader HSA Group. The entire project includes seven separate concessions, with four of them affiliated with HSA Group. Ciliandry Anky Abadi, another top deforester, is owned by the Fangiono family. The Fangiono family also own 65 percent of First Resources Ltd, which is a significant supplier to at least 20 traders/refiners and consumer goods companies with NDPE policies. CRR covered this commercial relationship in its June 2018 report on shadow companies and how they present palm oil investors with risks and undermine NDPE efforts. The report showed how the close ties between the two companies may present risks to companies and investors. PT Ciliandry Anky Abadi is deforesting on its PT Agrindo Green Lestari and PT Citra Agro Abadi in Central Kalimantan. At number six is the Bewani Oil Palm Plantation (BOPPL) in Vanimo, Papua New Guinea, where 3,000 ha was cleared in 2018. The plantation is owned by nine members of the Malaysian Tee family. The Tee family has majority and minority ownership of a number of companies known as the Prosper Group, which includes the Bursa Malaysia-listed Far East Holdings Bhd and Future Prelude Sdn Bhd. The Tee family, which owns BOPPL, is the majority owner of four palm oil mills and the minority owner of another four mills in Pahang, Peninsular Malaysia. These mills appear in the supply chains of many companies with NDPE policies, including Wilmar, Mewah , IOI, Musim Mas, Sime Darby, ADM, AAK, Cargill, Reckitt Benckiser, General Mills, P&G, Mondelez, Nestlé, Olam, Mars and Unilever. Mulia Sawit Agro Group has been clearing peat and peat forest on its PT Persada Era Agro Kencana plantation in Central Kalimantan. Mulia Sawit Agro Group, which was established in 2007 and operates five oil palm plantations and one mill in Central Kalimantan, appears in the supply chains of Mars, Bunge Loders Croklaan, Cargill, Musim Mas and PZ Cussons. The list is rounded out by Tunas Baru Lampung, Austindo Nusantara Jaya and Sawit Sumbermas Sarana. CRR has previously covered deforestation and peat clearance issues on their plantations. Austindo Nusantara Jaya was the first company known to have violated the RSPO’s new Principles & Criteria due to ongoing deforestation on its plantation in West Papua. The list of top 10 deforesters consists of listed and non-listed entities. In light of high investments risks related to market access, stranded land, and higher cost of capital in the case buyers execute NDPE policies, investors and financiers of listed growers are likely to be more alert to deforestation developments. Moreover, traders that source from these growers could face market risks. This situation would lead to higher investment risks for shareholders and other financiers of these traders. Finally, as a result of increasing transparency in sourcing by downstream companies, shareholders and financiers of these fast-moving consumer good companies would face reputation risks.